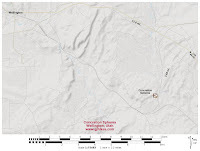 There is a very interesting and somewhat unusual site along the road leading from Highway 191 to the Cleveland-Lloyd Dinosaur Quarry that has a number of large concretion spheres that are as much as 8 or 9 feet in diameter. We originally created a Youtube slideshow back in 2014 that has been drawing enough views that we thought it was worth creating a post for the site. Besides that we have received emails asking where it was so here is what we've got. 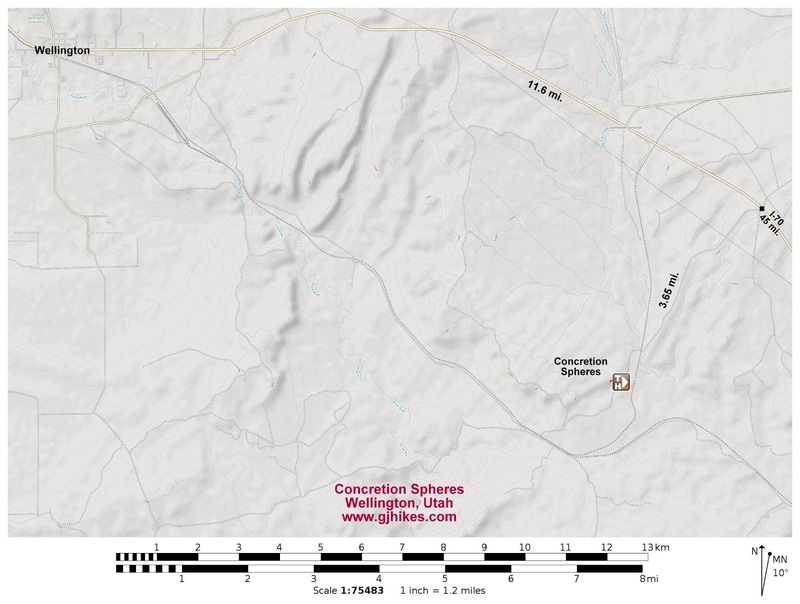 To get to the location of the Concretion Spheres from Wellington, Utah head south on Highway 191 for 11.6 miles and turn right onto the Mud Springs Road. There should be sign for the Cleveland-Lloyd Dinosaur Quarry at the turnoff. After 200 feet go to the right on the Drill Road, still following the directions to the Dinosaur Quarry. At the 3 mile point from the highway the road crosses a creek that at times may require a high clearance vehicle. Around the 3.6 mile point look off to the right and you should be able to easily see some of the large concretion spheres. Other than possible footprints from other visitors there is no trail to follow. Just pick out the sphere that you would like to get a better look at and head in that direction. The spheres that are still in one piece are all higher up the mountain. They are really worth the effort to scramble up there for a closer look. This particular sphere is probably 8 or 9 feet in diameter. Many of the spheres are still embedded within the mountain. You can walk all along the hill just below the rim and check them out. The broken spheres are just as interesting as the ones that are still intact. The lines running through this one resemble the smaller septarian nodules that can be found at many of the rock shops in Utah. Here is a fossilized clam shell that we noticed. We left it on a rock so that others might also see it. There are quite a few other fossils that one might expect to find in this formation. Probably the most amazing thing though is just seeing the massive spheres sticking out of the cliff. The spheres are a nice side attraction for those that are already traveling through the area. Rockhounds will also probably enjoy exploring the site as it pertains to their hobby. It might not take much to dislodge some of the spheres so precaution should be taken to avoid that. We have seen spheres of a similar size elsewhere in the San Rafael Swell but as yet not in this quantity. Anyway, if you would like to see it for yourself then all you have to do is 'Take a hike'.